During a recent trip to New York City, I found myself becoming more and more annoyed. The noise was driving me crazy. That got me thinking. What is the problem with noise? What does it do to people who live in noisy places? It can cause physical problems including coronary artery disease, high blood pressure, migraines, and reduced and poor quality sleep. Loud noises such as those from factory machines, construction sight banging or even rock music can damage and destroy the hair cells in our ears responsible for relaying sound signals to the brain. Once the hairs are gone they cannot be replaced. Whether the sound is scary or not, the body experiences a stress response which can cause high blood pressure (that can increase the risk for heart disease) and the continuous release of stress hormones if the noise continues. Noise is associated with trouble concentrating, poor learning in children, reduced motivation and aggressive behavior when prolonged. A study done in New York City in the 1970’s found that noise has a negative impact on learning. Unfortunately, urban development has caused the noise levels to go up and it is having a negative effect on the population exposed. One of the places with growing noise issues is the hospital. There are beeps and machine noises and a continuous din in most hospitals. Knowing this, it is key that we all find a way to be quiet. Getting out into nature is an easy way to escape the noise. Living with it, there are some things that can help. Carpeting will dampen the sound. Double paned windows help. Planting trees around houses helps to cushion sound. If there is outside noise where you live, and it still gets in, then play soothing sounds and music to drown it out. If you work in a noisy environment or go to a loud concert then make sure you wear ear protection. If you wind up in the hospital, use your headphones, and drown out the noise with calming sounds. The effects of noise pollution are subtle but substantial. Being aware of the problem we can find ways to avoid the potential emotional and physical distress that can result. Every year there are blogs about how to avoid weight during the holidays. So, here we go again. I have some quick tips that I think will help. Make sure to eat a good breakfast on Thanksgiving Day so you aren’t ready to eat the turkey all by yourself. Go for a walk and relax before your dinner. Choose a small plate and take small amounts of food. Talking can distract you and cause you to eat faster. Fast music and being surrounding by fast eaters can do it as well. . So, chew slowly and enjoy every bite. Fill yourself up with veggies. Dessert is OK but take small amounts and bites. Watch the alcohol. Many drinks are loaded with calories and those who drink tend to eat more. Fill up by drinking plenty of water and staying hydrated. Finally, move around and socialize rather than hang out on the couch after dinner. Thanksgiving means different things to different people. For most it is a time to express gratitude for our freedom, and to enjoy family and friends. It is important not to get so rapped up in the food and festivities that we forget the true meaning. Have a healthy, happy and safe Thanksgiving. Recently I was invited to attend a private horse experience that was designed to help women who are breast cancer survivors. I went, because I wanted to know how it could help my patients. What I found was something that would help all my patients and my colleagues as well. Horses are intuitive beings that sense our emotions, our hearts and they are healers. 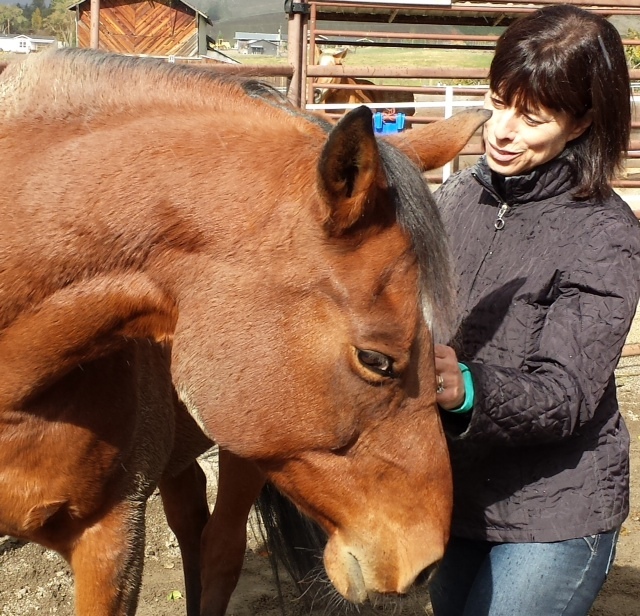 My experience started with an excellent orientation by Trish, the horse trainer and her assistants Jennie and Hannah. Then, I walked into the ring by myself with Mystic, the therapy horse. She is small (for a horse), powerful and beautiful. She approached me and I allowed her to nuzzle my hand. Then for a brief moment she wrapped her powerful head around to the small of my back signaling that she wanted her back rubbed, which I did. Then I was instructed on how to rock her hips ever so slightly and she became very calm. After that I hugged her. I placed my hand on her back and pressed my body up against her side with my hand over her heart. I felt like I could have stayed there forever. I was overwhelmed by something that is hard to describe. My heart opened and I felt a sense of pure love and acceptance and then I started to cry. It was amazing. What is really wonderful is that I remember the feeling. I am able to recall it when I feel scared or sad or insecure, and it comforts me. Horses have been used as therapy animals for centuries. In more recent times, they have been used to help those with PTSD, children with autism and those with disabilities to name a few. They are highly intuitive, and their rhythmic movement is similar to the human walking pattern, which is soothing. Their reactions to touch, brushing, grooming and bathing can be very calming. The Riding Beyond program has helped breast cancer survivors to feel accepted, strong and loved. For those that feel scarred and/or wounded, they feel whole. Mystic is quite a therapist along with her wonderful, caring trainers. Therapy horses are amazing beings. They can help all of us ride beyond whatever obstacles we encounter in our lives. In my opinion, it would be a more peaceful world if we could all have a horse therapy session!